March 2010 – Fight Aging! The gene that encodes for pregnancy-associated plasma protein-A (PAPP-A) is of interest because knocking it out - a method of rendering the gene inoperative - extends healthy life span in mice. This genetic manipulation is one of a number of ways to beneficially alter the insulin-like growth factor system to increase life span in lower animals. It also appears to slow the decline of the immune system with age. The pregnancy-associated plasma protein-A knockout (PAPP-A KO) mouse is a model of reduced local insulin-like growth factor (IGF)-I activity with normal circulating IGF-I levels. In this study, PAPP-A KO mice had significantly increased mean (27%), median (27%), and maximum (35%) life span compared with wild-type (WT) littermates. End-of-life pathology indicated that the incidence of [cancer] was not significantly different in the two groups of mice; however, it occurred in older aged PAPP-A KO compared with WT mice. Furthermore, PAPP-A KO mice were less likely to show degenerative changes of age. Scheduled pathologies at 78, 104, and 130 weeks of age indicated that WT mice, in general, had more degenerative changes and tumors earlier than PAPP-A KO mice. This was particularly true for abnormalities in heart, testes, brain, kidney, spleen, and thymus. In summary, the major contributors to the extended life span of PAPP-A KO mice are delayed occurrence of fatal [cancers] and decreased incidence of age-related degenerative changes. It all sounds good so far - this is one of only a couple of methods of healthy life extension discovered in mice that seem to have no significant downside. The quality of techniques to slow aging in the laboratory is certainly improving, but we must remember that they are only methods to slow aging. Even if they work well in humans, a slowdown in the aging process does little for a person who is already old - and in the present regulatory environment we stand two decades away from any future commercial application of a presently interesting result in mice. What we want to see is more work on technologies of damage repair for the aging body rather than on technologies that only slow down the rate at which that damage occurs. A paper on mitochondrial DNA (mtDNA) damage and its role in aging: "Mitochondrial dysfunction is heavily implicated in the multifactorial aging process. Aging humans have increased levels of somatic mtDNA mutations that tend to undergo clonal expansion to cause mosaic respiratory chain deficiency in various tissues, such as heart, brain, skeletal muscle, and gut. Genetic mouse models have shown that somatic mtDNA mutations and cell type-specific respiratory chain dysfunction can cause a variety of phenotypes associated with aging and age-related disease. There is thus strong observational and experimental evidence to implicate somatic mtDNA mutations and mosaic respiratory chain dysfunction in the mammalian aging process. The hypothesis that somatic mtDNA mutations are generated by oxidative damage has not been conclusively proven. Emerging data instead suggest that the inherent error rate of mitochondrial DNA (mtDNA) polymerase gamma (Pol gamma), [a protein responsible for mitochondrial DNA replication and repair], may be responsible for the majority of somatic mtDNA mutations. The roles for mtDNA damage and replication errors in aging need to be further experimentally addressed." From the Wall Street Journal: "a growing number of researchers have been seeking to understand how telomeres work. One feat researchers have accomplished in the lab is using telomerase to 'immortalize' human cells. Scientists [have] shown they can keep certain types of cells living forever, including those from the breast, skin, retina and, recently, the colon, by adding telomerase to keep telomeres intact or repair those that became too short. Now researchers are studying how telomerase-based therapies could help repair damaged cells and play an major role in cancer research. ... What our goal should be isn't increasing life span, but healthy life span. Is there some way we can intervene and slow down some of the problems? ... if a telomerase-based therapy could be given to specific cells temporarily, say for a week or two, it could be a therapeutic 'home run,' repairing telomeres and allowing cells to keep dividing ... Such a therapy - which would actually occur on a patients' own cells grown in a lab dish - could help people with conditions where cells have been injured and have used up their allotment of telomeres, such as anemia or skin sores or conditions involving inflammation. Many cancer researchers are trying to figure out how to turn off telomerase and potentially treat cancer. ... In experiments with lung cells, [scientists] are exploring how telomerase could be an alternative - and potentially easier - way of using stem cells to grow healthy tissue, without turning them all the way back to their embryonic state." Cancer, diabetes, and aging are related by their use of the PI3K-PTEN-Akt-TOR signaling pathway. This pathway controls how cells grow when nutrients are available and plays a role in how caloric restriction is able to extend lifespan. If parts of the pathway malfunction due to somatic or genetic mutations, cancer or diabetes can result. Thus, the pathway presents an exciting new frontier in medicine as researchers discover how to treat diseases by stopping the propagation of harmful signals and promoting the transmission of beneficial ones. Research in past years has shown benefits to health and longevity in some species as a result of suppressing forms of PI3K. It's a little early to say why this is the case, but it all looks very similar to many more recently discovered ways of recreating some of the benefits of calorie restriction upon metabolism. That, at least, is the first thought that springs to mind whenever researchers obtain any modest benefit from tinkering with metabolic controls. Our work suggests that the peptides, or fragments, of β-amyloid associated with Alzheimer's disease directly increase the activity of PI3 kinase, which in turn causes memory loss and increases the accumulation of plaque in the brain. A reduction of this activity via injections of PI3 kinase-blocking drugs or by switching off the gene that encodes PI3 kinase [not] only improved memory in aging fruit flies, but also decreased the buildup of β-amyloid deposits. These findings on β-amyloid's effect on PI3 kinase activity might explain another mystery about the disease. Among patients, the disease is sometimes known as "brain diabetes" because brain tissue gradually becomes resistant to insulin, further impairing brain function. Insulin is one of the molecules that normally induce PI3-kinase activity, which in turn mediates the cell's response to insulin. "Our results now suggest that the Alzheimer's brains might become insulin-resistant because PI3 kinase activity is already at the maximum due to its activation by β-amyloid and therefore is no longer able to respond to insulin," explains Zhong. "It might be possible to tackle these various disease symptoms by targeting PI3 kinase." The tie-in to previous established similarities between Alzheimer's disease and diabetes (including the risk factors - just so you know exactly where that excess body fat and lack of exercise is taking you) is what makes the suggested connections plausible here. If so inclined, you might want to take a look at the original paper. We shall see where it all goes, but I imagine PI3K inhibitors will be in the drug pipeline for this or other reasons not too many years from now. Here is an interesting theory on the contribution of nuclear DNA damage to aging, and double strand breaks in particular: "Advancing age remains the largest risk factor for devastating diseases, such as heart disease, stroke, and cancer. The mechanisms by which advancing age predisposes to disease are now beginning to unfold, due in part, to genetic and environmental manipulations of longevity in lower organisms. Converging lines of evidence suggest that DNA damage may be a final common pathway linking several proposed mechanisms of aging. The present review forwards a theory for an additional aging pathway that involves modes of inherent genetic instability. Long interspersed nuclear elements (LINEs) [such as L1 are] retrotransposons that compose about 20% of the human genome. ... While principally active only during embryogenesis, L1 transcripts are detected in adult somatic cells under certain conditions. The present hypothesis proposes that L1s act as an 'endogenous clock', slowly eroding genomic integrity by competing with the organism's double-strand break repair mechanism. Thus, while L1s are an accepted mechanism of genetic variation fueling evolution, it is proposed that longevity is negatively impacted by somatic L1 activity. The theory predicts testable hypotheses about the relationship between L1 activity, DNA repair, healthy aging, and longevity." Researcher Steven Austad lists the advances made by the mainstream of aging research last year: "Among the notable trends seen in this year's highlights in mammalian aging research is an awakening of interest in the assessment of age-related measures of mouse health in addition to the traditional focus on longevity. One finding of note is that overexpression of telomerase extended life and improved several indices of health in mice that had previously been genetically rendered cancer-resistant. In another study, resveratrol supplementation led to amelioration of several degenerative conditions without affecting mouse lifespan. A primate dietary restriction (DR) study found that restriction led to major improvements in glucoregulatory status along with provocative but less striking effects on survival. Visceral fat removal in rats improved their survival although not as dramatically as DR. An unexpected result showing the power of genetic background effects was that DR shortened the lifespan of long-lived mice bearing Prop1(df) whereas a previous report in a different background had found DR to extend the lifespan of Prop1(df) mice. Treatment with the mTOR inhibitor, rapamycin, enhanced the survival of even elderly mice and improved their vaccine response. Genetic inhibition of a TOR target made female, but not male, mice live longer. This year saw the mTOR network firmly established as a major modulator of mammalian lifespan." The tissue engineering of bone is fairly advanced in comparison to that of most of the rest of our biology. In part, it is an easier problem from a mechanical point of view, as the medical community has decades of experience in the nuts and bolts of replacing lost bone with other substances. So replacing bone with freshly grown new bone is in many ways an easier proposition that what already takes place in hospitals around the world. If labs can generate the bone tissue, there is a commercial network of medical providers ready and waiting to make use of it. Gordana Vunjak-Novakovic, a professor of biomedical engineering at Columbia University, has solved one of many problems on the way to successful bone implants: how to grow new bones in the anatomical shape of the original. ... "We are starting studies with large animals that will establish safety and feasibility before commercialization," she said. Dr. Vunjak-Novakovic, Dr. Warren L. Grayson and other members of the team used digital images of the joint to guide a machine that carved a three-dimensional replica, called a scaffold, from cleansed bone material. The team turned the bare scaffold into living tissue by putting it into a chamber molded to its exact shape, and adding human cells, typically isolated from bone marrow or liposuctioned fat. A steady source of oxygen, growth hormones, sugar and other nutrients was piped into the chamber, or bioreactor, so the bone would flourish. Professor Hollister at Michigan is also working on creating bones of a jaw joint. But instead of using a bioreactor to grow them, he plans to use the human body as the incubator. The scaffold for the new bone, designed from a CT scan and printed directly using a laser system, is filled with cells from bone marrow or fat that are taken from the patient to prevent immune-system reactions. "Then we will let the patient’s body naturally heal and reconstruct the tissue as the implant is resorbed by the body," he said. Many of the components to generate good bones are in place, said David L. Kaplan, professor and chairman of the department of biomedical engineering at Tufts University. "The technology is here," he said, "to control the size, shape and functional features of human tissue in the lab." Promising advances are taking place here and now in regenerative medicine and tissue engineering. It's a very active, exciting field of human endeavor. Here, h+ Magazine looks at Methuselah Foundation supported tissue printing company Organovo: "The December 2009 press release created quite a stir: Organovo, a San Diego-based company that specializes in regenerative medicine announced a new $200,000 bioprinter that prints artificial organs using inkjet technology. Partner engineering firm Invetech in Melbourne, Australia designed and developed what may well turn out to be the world's first production model 3D bioprinter ... Since the 2009 press release, Invetech has cemented its plans to ship a number of 3D bioprinters to Organovo during 2010 and 2011. Organovo will then distribute them globally to researchers at world-class medical research centers. These initial units will be capable of printing only very basic tissues like blood vessels, not full-blown organs. Nevertheless, this technology has attracted the attention of longevity pioneer Aubrey de Grey and his Methuselah Foundation. What better way to counteract a damaged or aging heart, kidney, or liver than to replace it with a new one? Rather than wait for a donor organ, simply print one. That might just add a few years to your life. ... You give us your cells: we grow them, we print them, the structure forms and we are ready to go. I am pretty sure that full organs will be on the market [one day]." From the SENS Foundation, an update on allotopic expression of mitochondrial DNA - the SENS approach to eliminating the contribution of mitochondrial DNA damage to aging. Vulnerable but essential mitochondrial genes are copied into the protected cell nucleus, and one of a variety of strategies are then used to ensure the encoded proteins get back to the mitochondria where they are needed: "To date, three of the thirteen OXPHOS genes still encoded in the mitochondria have been allotopically expressed (AE) in human cells ... In work funded by SENS Foundation, Corral-Debrinski's group have used their improved AE technique of relocalizing translation of AE genes to the mitochondrial surface [to] reverse blindess in rats caused by exposure to mutations in this gene ... Now we have the first report of a new gene, COX2, being allotopically expressed in yeast, by mutating the gene to overcome the hydrophobicity of the mitochondrial membrane ... This is an exciting advance [and] the first allotopic expression of this respiratory chain component in a species in which evolution has never accomplished the feat for itself. The next step, of course, is to do it in mammalian cells - preferably, of our own species. And the same broad strategy likely applies to many of the other remaining [thirteen genes of interest]; indeed, during his work sponsored by SENS Foundation, Mark Hamalainen developed software that models hydrophobicity of proteins, and it predicts that a relatively small number of relatively minor amino acid changes would lower the hydrophobicity [sufficiently] to make them importable when the native gene likely is not." Via Ouroboros, I am directed to notice that the latest issue of Nature Insight covers aging science, and for the moment at least is open access - jump in and take a look. These promotional gaps in the journal pay walls don't tend to last all that long, so make make the most of it. For the attention deficit generation, there's even an audio podcast that outlines this research and its significance. It is now clear that by tinkering with particular signalling pathways and by balancing nutrition, the lifespan of many organisms, including yeast, worms, flies and mice, can be extended. Crucially, the same tweaks often bring about substantial health benefits and seem to delay the onset of age-related diseases. Most of the pathways involved are evolutionarily conserved, so it is likely that some of this research will eventually benefit human health. For many years, molecular biologists interested in regulatory mechanisms did not study ageing, as the tissue decline associated with ageing suggested a passive, entropic process of deterioration that occurred in a haphazard way. We know now, however, that the ageing process, like so many other biological processes, is subject to regulation by classical signalling pathways and transcription factors. Many of these pathways were first discovered in small, short-lived organisms such as yeast, worms and flies, but a remarkable fraction turn out to extend lifespan in mammals as well. The budding yeast Saccharomyces cerevisiae is one of the most important model organisms used in ageing-related research. In comparison with other systems, the relative ease and rapidity with which longevity can be quantified in yeast has allowed rapid progress is defining the molecular mechanisms of ageing in this organism and the identification of dozens of factors that modify its longevity. How much of what we learn about ageing in yeast is relevant to people has become an important question. We do not yet know the answer, but the evidence so far suggests that although some aspects of ageing in yeast are specific to this organism, many of the most important features have been evolutionarily conserved in invertebrate species and rodents. Increasing evidence points to telomeres and p53-mediated DNA damage signalling being core components that drive the senescent or apoptotic depletion of tissue stem-cell reserves and age-related tissue degeneration. Although such cellular checkpoint mechanisms contribute to the functional decline of highly proliferative tissues, how they would adversely affect the more quiescent tissues that are equally ravaged by the ageing process (such as heart, brain and liver) has been more difficult to rationalize. Here, we put forth a speculative model that posits a connection linking telomere damage and p53 activation with stem-cell and mitochondrial dysfunction. This model offers a unifying explanation of how telomeres influence the health of the ageing organism across diverse tissues with wide-ranging proliferative profiles. Two important technical advances have provided new insight into the biology of brain ageing. Microarray technology has made global gene expression analysis possible in humans and model organisms, leading to the identification of evolutionarily conserved changes during ageing. Concurrently, improvements in functional brain imaging have afforded us an unprecedented view of the workings of large-scale cognitive networks in the ageing human brain. An important challenge is to unify these two levels of analysis to obtain a more global view of brain and organismal ageing in humans. The finding that mortality at advanced ages can be postponed, and indeed is being postponed, resolved a millennia-old debate about whether survival could be extended among the elderly. The evidence published since 1994 is compelling. Unless radical breakthroughs are achieved, perhaps as a result of research on other species, humans will continue to suffer senescence - but the process is not intractable. Mortality has been postponed considerably, as a result not of revolutionary advances in slowing the process of ageing but of ongoing progress in improving health. From ScienceDaily: "scientists transplanted embryonic neurons from fetal rats into an area of the adult rat brain known as the striatum, which integrates excitatory and inhibitory neurotransmitter signals to control movement. In Parkinson's disease, cells that produce the neurotransmitter dopamine are damaged, and thus unable to project their communication wires, or axons, to the region. As a result, the balance of excitation and inhibition in the striatum is lost, causing the motor deficits that are a primary symptom of the disease. ... the transplanted embryonic neurons migrated and integrated into the correct neural circuitry of the striatum, matured into so-called GABAergic inhibitory interneurons, and dampened the over-excitation in the region. The rats had improved motor function, as seen in their balance, speed, and length of stride during walking. Moreover, the healthy 'control' rats in which the cells had been transplanted took longer strides and ran faster on a runway test." This won't be the last time that transplant of fetal or embryonic cells shows benefits in normal recipients as well as those suffering from disease - all the more reason to understand how to reprogam adult cells to look more like fetal cells. As researchers learn more of the mechanisms of the immune system, they will be able to selectively reprogram its components - and thus cure many of the conditions that result from immune system malfunctions. From EurekAlert! : "immune system components known as regulatory T cells counterbalance the tendency of conventional T cells to become overactive, thus holding inflammation in check. These regulatory T cells exert their influence by communicating with other parts of the immune system. ... an enzyme known as protein kinase C theta is only partly activated in regulatory T cells. When the regulatory cells are most active, in fact, most of the interfering enzyme is physically kept far away from the area important for cell-cell communication. ... researchers began testing inhibitors of this kinase enzyme, including a molecule known as Compound 20 ... the compound boosted the normal activity of regulatory T cells by about five-fold [and] defective regulatory cells from [patients] were revived in tissue cultures with this enzyme inhibitor ... We could get them back to almost a normal level of activity, like what you'd see in a healthy individual. ... When the researchers treated the regulatory T cells with the enzyme inhibitor and then injected them into the mice [with the mouse version of Crohn's disease], their anti-inflammation activity rose so much that they essentially protected the mice from the disease, even though the cells were outnumbered four to one by their pro-inflammatory counterparts." As you might know, the Methuselah Foundation volunteers are presently engaged in initiatives that attempt to broaden the pool of people who support engineered longevity. Those of us who are already enthusiastic about the idea of science to help us life much longer are comparatively rare outliers: we tend to understand how technology can change the world around us, and feel comfortable estimating the plausibility of future technologies based on present trends and capabilities. But most people live in the here and now: it's hard to persuade them that the future will be far different from what they see today. Yet these folk make up the majority of the population, and until we can persuade them to see things our way, the quest to extend the healthy human life span will remain a fringe interest. We need the enthusiasm and help of the masses to support the pace and breadth of progress we'd like to see. Methuselah Foundation, a medical non-profit dedicated to extending healthy human life, today announced that it has made an investment in Silverstone Solutions, Inc., a San Francisco-based innovator in life science computing. Silverstone is the leading provider of software that matches recipients and donors in Kidney Paired Donations (KPDs). With this infusion of funding, Methuselah Foundation and Silverstone Solutions will partner to create an online NewOrgan Registry that will connect the millions of people who could benefit from new organs by making their collective medical information available to clinical researchers and scientists. This funding further advances the strategy of the Methuselah Foundation to accelerate medical research that delivers fundamental technologies to extend healthy human life. "The kidney matching capability of MatchMaker and the tissue printing capabilities of Organovo's tissue printer heralds the dawning of a whole new era in organ transplantation, regenerative medicine and in the not too distant future - the creation of whole new replacement organs from one's own cells," noted Gobel. "As a result, the Foundation's donors have made yet another significant contribution to save, extend and improve significant numbers of lives." You should be able to speculate from here as to the future directions of this initiative; clearly the Foundation volunteers want to speed the development of tissue engineered organs, and feel that this is a good way to further the message that engineered longevity is within our grasp and worth supporting. A Forbes columnist points out the insanity of the FDA regulations that block any consideration of treating aging: "For the most part, the FDA still operates under the medical mind-set that prevailed when the federal drug law was amended in 1962. The go/no-go regulatory calls are decided by clinical trials. The key metrics are clinical, like the survival time for a cancer patient. A clear reduction in mortality from a serious disease gets the drug licensed on the double. So far, so good - this panel sounds diligently antideath. But it's interested only in brinkmanship, at the back end. The 'aging' drugs that the FDA deals with reasonably well are the ones that beat back a single specific disease long after the microscopic seeds of the problem have blossomed into big symptoms. Aging is an incremental, whole-body problem. All cells, tissues and organs age - and in different ways, at different rates, in different people. As defined by their late-stage clinical symptoms, the diseases of old age are legion. At the FDA they will have to be beaten one at a time or not at all. Which means that nobody is ever going to get 'antiaging' drugs through the FDA as it currently operates. Certainly not drugs that operate the way [biomedical gerontologist Aubrey de Grey] suggests they might, by repairing damage at the cellular level before it morphs into clinical problems." Researchers continue to delve into the details of regeneration in lower animals: "Bony fish like the tiny zebrafish have a remarkable ability that mammals can only dream of: if you lop off a chunk of their heart they swim sluggishly for a few days but within a month appear perfectly normal. How they accomplish this - or, more importantly, why we can't - is one of the significant questions in regenerative medicine today. .. [Researchers have] identified a fish heart cell population that is the source of this astonishing healing feat ... well established cardiomyocytes remaining after injury had likely regressed to a more 'youthful' state, started dividing again to replenish lost cells, and then matured a second time into new heart muscle. The group also showed cardiomyocytes recaptured lost youth in part by re-activating the production of proteins associated with cell proliferation, factors typically expressed in immature progenitors. Human hearts cannot undergo these types of regenerative changes on their own. When damaged by heart attack, our heart muscle is replaced by scar tissue incapable of contracting. However, prior to heart failure, damaged mammalian heart muscle cells enter a save-yourself state known as 'hibernation,' in which they cease contracting in an effort to survive. ... During heart regeneration in the zebrafish we found that cardiomyocytes displayed structural changes similar to those observed in hibernating cardiomyocytes. Because of these similarities, we hypothesize that hibernating mammalian cardiomyocytes may represent cells that are attempting to proliferate." Research prizes are demonstrably effective when it comes to producing results, as measured in funds raised and new technologies developed. One of the more influential organizations in the aging research space, the Methuselah Foundation, started out focused on a research prize for engineered longevity, and there are many historical examples of prize-spurred innovation. almost everyone has heard of cryonics but assumes the entire concept is fundamentally flawed. The concept is not flawed; it just requires diligent research and technology development to perfect the technique of brain preservation. A Brain Preservation Technology Prize has the unique ability to get the scientific community to start asking these questions. It can accomplish this purely by putting forward a clear set of milestones for a preservation technique to achieve. Brain preservation is simply the only possible alternative to death on the near-term (<20 years) horizon, but today there is almost no serious research being performed on the topic. We simply must reinvigorate scientific debate on this important subject. A well publicized and adequately funded prize will do just that. You should read through the rest of the brain preservation website. It is a reasoned look at the issues, both technological and cultural, that stand as hurdles to saving billions of lives through preservation of human brain structure. Our selves, our minds, are complex computational devices whose processes and data are defined by the fine structure of our brains. If that structure can be preserved well enough, and there are those who argue that present day vitrification technology is indeed good enough, then we could evade death by aging and wait for a future in which advanced technology can return us to active life. This is not a ridiculous vision, and trends in technology give us every hope that restoring vitrified people to life will be practical well before the end of this century. It will require precision engineering and robotics at the nanoscale, as well as a complete grasp of human biochemistry - none of which are much disputed as realistic goals for the next few decades. Nonetheless, people find it hard to look beyond what is, especially in times of rapid change. Preserving the brain has little support and few resources are dedicated to furthering any form of widespread implementation, and so when people die, they die forever - save for the tiny handful whose brains have been preserved. One day, our descendants will look back on us as superstitious barbarians who committed negligent suicide en mass rather than embrace our newfound ability to save ourselves from degeneration and death. They will be right. From Reason Magazine, a look at where the economics of medical research and development are heading, thanks to the ever-increasing adverse effects of regulation: "At the beginning of the last decade, there was great excitement about the future of medicine. Advances in biotechnology, nanotechnology, diagnostics, information technology, stem cell treatments, vaccines, and organ transplants were poised to radically improve the health prospects of Americans. Looking back from 2020, we can see that most of these major biomedical advances failed to materialize. What happened? Three words: health care reform. ... Big pharmaceutical companies initially did fairly well under health care reform, but as the cost of health care rose partly as a result of covering more Americans, Congress enacted legislation allowing government health care schemes to 'negotiate' pharmaceutical prices. The negotiation requirement quickly devolved into price controls that have ultimately turned the big drugmakers into little more than cost-plus government contractors. In addition, the feds have established a comparative effectiveness evaluation commission similar to the British National Institute for Health and Clinical Excellence which limits patient access to treatments based on their overall cost-effectiveness. The result of these restrictions is that investments in pharmaceutical and biotech research and development have fallen off sharply. ... The seen aspect of health care reform is that it has had some success in providing more Americans with access to vintage 2010 medical therapies. The unseen aspect is that more people are suffering from and dying of diseases that might well have been cured." Via PhysOrg.com: researchers have found "elderly people with super-sharp memory - so-called 'super-aged' individuals - who somehow escaped formation of brain 'tangles.' The tangles consist of an abnormal form of a protein called 'tau' that damages and eventually kills nerve cells. Named for their snarled, knotted appearance under a microscope, tangles increase with advancing age and peak in people with Alzheimer's disease. ... its implications are vast. We always assumed that the accumulation of tangles is a progressive phenomenon throughout the normal aging process. Healthy people develop moderate numbers of tangles, with the most severe cases linked to Alzheimer's disease. But now we have evidence that some individuals are immune to tangle formation. The evidence also supports the notion that the presence of tangles may influence cognitive performance. Individuals with the fewest tangles perform at superior levels. Those with more appear to be normal for their age. ... One group of super-aged seems to dodge tangle formation. Their brains are virtually clean, which doesn't happen in normal-aged individuals. The other group seems to get tangles but it's less than or equal to the amount in the normal elderly. But for some reason, they seem to be protected against its effects." Elderly individuals display increased susceptibility to chronic inflammatory diseases and microbial infections, such as periodontitis and oral aspiration pneumonia. The resurgent interest in innate immunity in the 2000s has been accompanied by parallel studies to understand the impact of aging on the function of the innate immune system, which not only provides first-line defense but is essential for the development of adaptive immunity. This review summarizes and discusses our current understanding of age-associated molecular alterations in neutrophils and macrophages, key inflammatory phagocytes implicated in both protective and destructive host responses. The analysis of recent literature suggests that, in advanced age, phagocytes undergo significant changes in signal transduction pathways that may affect their ability to perform antimicrobial functions or regulate the inflammatory response. These abnormalities are expected to contribute to the pathology of oral infection-driven inflammatory diseases in the elderly. Moreover, the elucidation of age-associated defects in the innate immune system will facilitate the development of intervention therapeutic strategies to promote or restore innate immune function and improve the quality of health in old age. This all ties into research on inflammaging, a term for the characteristic increase in levels of chronic inflammation coupled with a weakened immune system seen in the old. This is the outcome of systematically malfunctioning components of the immune system - which means that once researchers understand why this is happening, it will be possible to intervene and restore an age-damaged immune system to a more youthful state of operation. Via EurekAlert!, an estimate of the cost of poor lifestyle choices: "A new study [estimates] that smoking, high blood pressure, elevated blood glucose and overweight and obesity currently reduce life expectancy in the U.S. by 4.9 years in men and 4.1 years in women. It is the first study to look at the effects of those four preventable risk factors on life expectancy in the whole nation. ... Smoking, high blood pressure, elevated blood glucose and obesity are responsible for hundreds of thousands of deaths from chronic diseases such as cardiovascular diseases, cancers and diabetes, in the U.S. each year. ... For their study, the researchers used 2005 data from the National Center for Health Statistics, the National Health and Nutrition Examination Survey, the Behavioral Risk Factor Surveillance System, and an extensive review of epidemiologic studies on the effects of these factors. They estimated the number of deaths that would have been prevented in 2005 if exposure to the four risk factors had been reduced to their optimal levels or commonly used guidelines. They also assessed the benefits for life expectancy, a measure of longevity. ... As a result of these patterns, smoking, high blood pressure, elevated blood glucose and overweight and obesity account for almost 20% of disparities in life expectancy across the U.S. These four factors also accounted for three quarters of disparities in cardiovascular mortality and up to half of disparities in cancer mortality." From the Jerusalem Post: "researchers have discovered that pregnancy has the remarkable ability to promote the regeneration in elderly mice of damaged livers and muscles. They have also managed to mimic the state of pregnancy using specific molecules that trigger the regeneration and growth of livers in older rodents. This basic new concept [could] eventually be relevant to other tissues and organs and lead to the ability to stimulate their regeneration in elderly, sick patients. ... [Earlier researchers] had connected young mice to other young mice by uniting their blood vessels; old mice to old mice; and young mice to old mice (this procedure is called parabiosis). ... pregnancy was a kind of parabiosis in which a mother is connected by blood vessels to its young fetus. ... The team studied mice and indeed found that damage to tissue in the foot muscle (and later liver) of an older but pregnant mouse was quickly repaired, as if it had been connected to a live young animal. ... pregnancy causes a switch from regeneration based on proliferation (an increase in the number of cells due to cell division) to regeneration caused by hypertrophy (the increase in the volume of an organ or tissue due to the enlargement of its component cells). Certain molecules given to aged mice induced hypertrophy in their livers, thus mimicking the state of pregnancy and lengthening their lifespan." The various known accelerated aging conditions can teach us about the mechanisms of normal aging. Here, USA Today looks at Down syndrome in this context: "People with Down syndrome tend to age prematurely as they develop conditions such as menopause, brittle bones, arthritis, hearing loss, wrinkles and sagging skin about two decades earlier than usual ... Yet researchers suspect that this unique genetic profile also protects people with Down syndrome from many common ailments. ... most adults with Down syndrome are overweight with high cholesterol. Despite these risks, however, people with Down syndrome virtually never develop high blood pressure, heart attacks or hardening of the arteries ... with the exception of a rare pediatric leukemia, even elderly adults with Down syndrome rarely develop solid tumors, such as those of the breast or lung. ... Although people with Down syndrome are at higher risk for cataracts, they rarely develop a form of blindness called macular degeneration, caused by an overgrowth of blood vessels in the retina ... Doctors suspect that the same genes [duplicated in Down syndrome] that restrict blood vessel growth in tumors may also prevent abnormal blood vessel growth in the eye. ... Adults with Down syndrome appear to develop the brain plaques and tangles characteristic of Alzheimer's disease very early in life ... By age 40 to 45, virtually everyone with Down syndrome has these plaques and tangles, [and by] age 65, up to 75% of people with Down syndrome have dementia." The the Technology Review: "A specialized nanoparticle filled with an RNA-based cancer therapy can successfully target human cancer cells and silence the target gene, according to results from an early clinical trial. The research [is] the first to demonstrate this type of tissue targeting and gene-silencing in humans. ... Since the discovery 12 years ago that double-stranded RNA can silence genes in a targeted manner, researchers have hailed the technique, known as RNA interference (RNAi), as a powerful approach to creating new and potent medicines. ... The trouble is, getting the therapeutic RNA to the right cells has proven to be a sticky challenge. When injected on their own, so-called small interfering RNAs (siRNAs) are quickly filtered out by the kidneys, and researchers have struggled to design particles that carry their contents to target cells with enough specificity, or that don't cause toxicity or elicit an immune reaction from the body. ... The new trial [is] the first to administer the RNA therapy systemically into the body, using specialized particles that protect the RNA while in the bloodstream and target it directly to cancer cells. ... The researchers analyzed biopsy samples from three melanoma patients in the trial who had received different doses of the therapy. They tracked the particles in the different samples, finding that the amounts they could see in the tumor cells correlated with the doses the patients received." The long-term practice of calorie restriction has been demonstrated to slow almost every aspect of age-related change and degeneration in those mammals most exhaustively tested (i.e. mice and rats). So far the primate and human studies are producing the same sorts of result, but it will be another decade or more before the present research community has covered all the bases in humans. Still, the evidence to date is very compelling: regular exercise and calorie restriction kept up over the years have a far more powerful positive effect on general health and longevity than any medical technology presently available. I noticed a paper today that demonstrates another benefit of calorie restriction in rats: it reduces lipofuscin buildup and the consequent damage to lysosomes, the cell's recycling units. This buildup of unwanted biochemicals that the body cannot break down is one of the fundamental contributions to age-related degeneration of the body, and less of it is better for you. Aging is associated with protein damage and imbalance in redox status in a variety of cells and tissues, yet little is known about the extent of age-related oxidative stress in the peripheral nervous system. Previously, we showed a drastic decline in the expression of glial and neuronal proteins in myelinated peripheral nerves with age, which is significantly ameliorated by lifelong calorie restriction. The age-related decline in functional molecules is associated with alterations in cellular protein homeostatic mechanisms, which could lead to a buildup of damaged, aggregated proteins. To determine the extent of oxidative damage within myelinated peripheral nerves, we studied sciatic nerves from rats of four different ages (8, 18, 29, and 38 months) maintained on an ad libitum or a 40% calorie-restricted diet. We found a prominent accumulation of polyubiquitinated substrates with age, which are associated with the conglomeration of distended lysosomes and lipofuscin adducts. The occurrence of these structures is notably less frequent within nerves of age-matched rodents kept on a lifelong reduced calorie diet. Markers for lipid peroxidation, inflammation, and immune cell infiltration are all elevated in nerves of ad libitum-fed rats, whereas food restriction is able to attenuate such deleterious processes with age. Together these results show that dietary restriction is an efficient means of defying age-related oxidative damage and maintaining a younger state in peripheral nerves. Calorie restriction essentially keeps your cells in better shape, amongst its other effects, and that helps to keep the functional structures of your body in better shape. It really is well worth your time to look into the practice of calorie restriction, and how you might make it work in your life. The early human trials of recellularized transplants continue to go well: "A 10-year-old British boy has become the first child to undergo a windpipe transplant with an organ crafted from his own stem cells. ... The world's first tissue-engineered windpipe transplant was done in Spain in 2008 but with a shorter graft. Doctors say the boy is doing well and breathing normally. ... In order to build him a new airway, doctors took a donor trachea, stripped it down to the collagen scaffolding, and then injected stem cells taken from his bone marrow. The organ was then implanted in the boy and over the next month, doctors expect the stem cells to transform into specialised cells which form the inside and outside of the trachea. ... more clinical trials were needed to prove the technique worked but that the team was also thinking about transplanting other organs, such as the oesophagus. ... The advantage of the new approach is that it can be performed quickly and cheaply and so if successful it could be made available to large numbers of patients at relatively low cost." The downside of recellularization is that it doesn't eliminate the need for a donor organ - but it does open up the possibility of using animal organs instead of human organs, with no threat of rejection, and it certainly contributes to advancing the state of the art. I expect to see recellularized heart transplants tested in humans within the next few years. With the launch of the new SENS Foundation website, a range of photographs and presentation videos from the most recent SENS conference are available for viewing: "The purpose of the SENS conference series, like all the SENS initiatives (such as the journal Rejuvenation Research), is to expedite the development of truly effective therapies to postpone and treat human aging by tackling it as an engineering problem: not seeking elusive and probably illusory magic bullets, but instead enumerating the accumulating molecular and cellular changes that eventually kill us and identifying ways to repair - to reverse - those changes, rather than merely to slow down their further accumulation. ... Videos of a number of talks are now available. The footage of the remaining talks is still being processed by our volunteers, but will be published as soon as possible." You might also dig into the Fight Aging! archives for the conference converage from the folk at Ouroboros. The new site is organized around a series of projects, which are in progress at our Research Center, in the facilities of our collaborators, or under the auspices of our Academic Initiative. Blogs and news items relating to all these projects will be added regularly, giving you an up-to-date picture of the work we do. News items from outside the Foundation, which relate to our mission, will be available here. Publications and proceedings of past conference are also available, and we'll be creating a wider media library over the coming months. 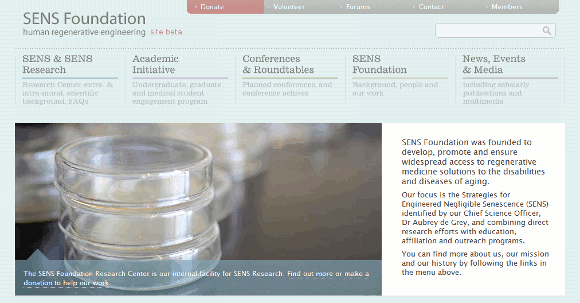 ... To make use of some of the features of the new sens.org - particularly our new forums - you'll need to register an account. You can do this by clicking here, or on the Members link in the top right hand corner. This paper shows researchers beginning to be able to distinguish between the genetic machinery that causes different parts of the calorie restriction effect on health and longevity: "The FoxO transcription factors may be involved in the antiaging effect of calorie restriction (CR) in mammals. To test the hypothesis, we used FoxO1-knockout heterozygotic (HT) mice, in which the FoxO1 mRNA level was reduced by 50%, or less, of that in wild-type (WT) mouse tissues. The WT and HT mice were fed ad libitum (AL) or 30% CR diets from 12 weeks of age. Aging- and CR-related changes in body weight, food intake, blood glucose and insulin concentrations were similar between the WT and HT mice in the lifespan study. ... Several of the selected FoxO1-target genes for cell cycle arrest, DNA repair, apoptosis, and stress resistance, were up-regulated in the WT-CR tissues, [while] the effect was mostly diminished in the HT-CR tissues. Of these gene products, we focused on the nuclear p21 protein level in the liver and confirmed its up-regulation only in the WT-CR mice in response to oxidative stress. The lifespan did not differ significantly between the WT and HT mice in AL or CR conditions. However, the [cancer resistance] effect of CR, as indicated by reduced incidence of tumors at death in the WT-CR mice, was mostly abrogated in the HT-CR mice. The present results suggest a role for FoxO1 in the [anti-cancer] effect of CR through the induction of genes responsible for protection against oxidative and genotoxic stress." From Singularity Hub: "Hans Keirstead used embryonic stem cells to help paralyzed rats walk again. His research is the basis for the first FDA approved clinical trial for the use of embryonic stem cells (ESC) - currently underway by Geron and aimed at treating spinal cord injuries. After years of controversy in the first part of the decade, ESC trials have finally started on the path that may let them deliver on the vast promises of stem cell enabled medicine. Yet we have already seen how autologous stem cell therapies (those which use a patient's own cells) are becoming available in the U.S and all over the world. Why the hold up on ESC treatments? Autologous therapies are part of the medical practice of individual doctors, given to their individual patients. Geron's clinical trials hope to usher in a new wave of globally used drugs and procedures. The rigorous science needed to obtain FDA approval for such widespread treatments is not easily achieved, but many still lament the slow process. To all of us wondering why ESCs are not yet available in every hospital across the world, Hans Keirstead has an explanation. He doesn’t make an impassioned plea, or take a rhetorically defensive stance. In just 5 minutes Keirstead walks us through the fundamental hurdles that scientists face as they try to bring ESC therapies to fruition. Everyone who wants an intellectual and scientific explanation of stem cell research should watch the video." The UCSF-led team determined that chronic stress, and the perception of life stress, each had a significant impact on three biological factors - the length of telomeres, the activity of telomerase, and levels of oxidative stress - in immune system cells known as peripheral blood mononucleocytes, in healthy premenopausal women. A greater weight of work over a much longer period of time links chronic psychological stress with poor health in general, and there is also reason to believe that shorter telomeres correlate well to poor health and greater risk of age-related disease. So does psychological stress over time cause what amounts to somewhat accelerated aging? This is plausible, but still unclear. While the research quoted above fairly clearly suggests that psychological stress leads to a less robust, more damaged immune system, with all that this implies for health and aging, the role of telomeres in the biochemical and cellular damage that accumulates with aging is not yet firmly established. They may be a root cause of age-related degeneration, or they may be a secondary marker of other processes, such as mitochondrial damage. Further, note that studies have generally looked at telomere length in only a limited population or subset of the body's different cell types. Telomere length is a measure of biological aging because telomeres shorten progressively with each cell division. Shorter telomere lengths have been linked to a variety of aging-related medical conditions including cardiovascular disease and cancer. Stress and trauma, such as childhood abuse and neglect, are risk factors for several medical and psychiatric illnesses, and stress is known to promote cellular aging. So, Audrey Tyrka and her colleagues from Butler Hospital and Brown University examined the DNA of healthy adults who had a history of childhood maltreatment and found they had shorter telomeres than those who did not experience child maltreatment. Dr. Tyrka explained that the findings "suggest the possibility that early developmental experiences may have profound effects on biology that can influence cellular mechanisms at a very basic level and even lead to accelerated aging." All of which still hinges on the role of telomeres in aging, and whether telomere length in any specific cell type is a good biomarker of aging - questions that remain in need of solid answers. As noted at In the Pipeline, researchers have recently generated a line of induced pluripotent stem (iPS) cells with long telomeres. Though no-one yet knows the precise cause, now that these cells exist as a point of comparison determining how to do it for all iPS cells will follow in time. Unfortunately, it has been somewhat overhyped in the press: this is just a promising step forward in the search for a solid, cheap source of patient-specific stem cells for regenerative medicine, not a sign of aging-reversal. "It seems to be interesting work that's a long way from application. Briefly [what] they're looking at is telomere length in various stem cell lines. Telomere length is famously correlated with cellular aging - below a certain length, senescence sets in and the cells don't divide any more. What's become clear is that a number of 'induced pluripotent' cell lines have rather short telomeres as compared to their embryonic stem cell counterparts. You can't just wave a wand and get back the whole embryonic phenotype; their odometers still show a lot of wear. [Researchers] induced in such cells a number of genes thought to help extend and maintain telomeres, in an attempt to roll things back. And they did have some success - but only by brute force. The exact cocktail of genes you'd want to induce is still very much in doubt, for one thing. And in the cell line that they studied, five of their attempts quickly shed telomere length back to the starting levels. One of them, though, for reasons that are completely unclear, maintained a healthy telomere length over many cell divisions. So this, while a very interesting result, is still only that." LabLit publishes an interview with biomedical gerontologist Aubrey de Grey, heavier on the human interest side than usual: de Grey moved from computer science to gerontology "because I met the right woman. There is a 19-year difference between us; I met her when she was 45 while I was at Cambridge. As scientists we spoke about science a lot. And we spoke a lot about the problem of aging and the more I read about it the more I got worked up about the problem. Now, 100,000 people die every day because of aging, which is not a joke. ... Luck has played an important role. When I wrote the first Bioessay in 1997, the editor of the journal was highly impressed with the essay and asked me to write a book. I finished the book before the deadline in Spring 1998 but the publishing house was in trouble. It took them a whole year to stand up on their feet and before they could publish my book they asked me to review it. In a year, I knew a lot more biology than before. I changed the bad job I had done into something that I am proud of even now. ... I believe that scientists can change fields easily and sometimes make a bigger impact in the new fields they enter. I think it's because people who move do not look at the same problem from the traditional point-of-view. This enables them to come up with unique solutions. We are not trapped by dogma and if we are bold we can rise quickly." The Longer Life Foundation is an example of one of the conservative funding sources in aging research; it is similar to the Ellison Medical Foundation in choices of which research to fund and the public face of the organization. Nothing that will rock the boat, in other words, or appear to be advocating near-future longevity engineering in humans. This describes much of the funding landscape, sadly, which is how the Glenn Foundation can look like a force for change by comparison, simply by talking about extending the healthy human life span in the context of funding mainstream aging research. The Foundation, a not-for-profit organization, funds research that has immediate and practical applications for health promotion and for the assessment of longevity trends. ... The Foundation will study the scientific and social factors that help predict longevity and wellness in selected populations, domestically and internationally. ... Findings will be published for the benefit of the entire medical community, to help improve human health and longevity. ... The Longer Life’s mission is to study factors that assist in predicting mortality and morbidity of selected populations and to research methods to promote improvements in longevity and health by analyzing the effects of changes in medicine and advances in public health practices. Over the last 10 years, the foundation has awarded more than $2 million to [Washington University]. This most recent group of grants provides a total of $279,000, and each grant award totals between $26,000 and $75,000. Grant renewals were awarded to John O. Holloszy, MD, professor of medicine, and Luigi Fontana, MD, PhD, research associate professor of medicine, for the "Longer Life Foundation Longevity Research Program," a project comparing key functions in people who practice calorie restriction with the same bodily functions in normal weight individuals and in endurance athletes. Also receiving a second year of funding was Shin-ichiro Imai, MD, PhD, associate professor of developmental biology and of medicine, for a project entitled "Diagnostic and Therapeutic Applications of a Novel Plasma Metabolite, Nicotinamide Mononucleotide (NMN), for Age-Associated Metabolic Complications in Humans." Another renewal went to Ravi Rasalingam, MD, assistant professor of medicine, for the project "Novel Methods for Detection of Coronary Artery Disease in Diabetic Patients," which is looking at the feasibility of using of sound waves to detect blocked blood vessels as a screening tool for people with diabetes who are at risk for coronary heart disease. New grants this year went to Marco Colonna, MD, professor of pathology and immunology and of medicine, for the project "Does Caloric Restriction Slow Aging of the Human Immune System?" There are a good few years of research results to suggest that calorie restriction does indeed slow the age-related degeneration of the human immune system. As you might have gathered from the list of awards above, Washington University is one of the research centers most involved in modern calorie restriction research. It is one of the host universities for the CALERIE study program, for example. CALERIE (Comprehensive Assessment of Long-term Effects of Reducing Intake of Energy) is a trial currently underway in the U.S. to study the effects of prolonged calorie restriction on healthy human subjects. The CALERIE study is being carried out at the Pennington Biomedical Research Center (Baton Rouge, Louisiana), the Jean Mayer USDA Human Nutrition Research Center on Aging at Tufts University (Boston, Massachusetts) and the Washington University School of Medicine (St. Louis, Missouri). Via EurekAlert! : "Bone marrow stem cells suspended in X-ray-visible microbubbles dramatically improve the body's ability to build new blood vessels in the upper leg - providing a potential future treatment for those with peripheral arterial disease or PAD ... They offer a future novel method to help PAD patients by increasing the number of blood vessels to replace or augment those choked off by plaque buildup ... With this treatment, the body was able to provide a more normal blood supply to the toes - possibly offering the hope of dramatically reducing - or avoiding - amputation. ... Because many treatments like stenting are done using X-rays, this microbubble stem cell treatment could be performed when an interventional radiologist is performing a dye study to look at a patient's arteries. Since an interventional radiologist can see where he or she puts the stem cells and whether they remain in the leg, the stem cells could be administered potentially where they can do the most good. The treatment could be repeated, if needed. ... researchers used a technique that encloses stem cells derived from bone marrow (not embryonic stem cells) in an alginate capsule or microbubble made from seaweed that contains stem cells to create factors to recruit the building of new vessels along with an X-ray-visible contrast agent. Tested [in rabbits], the bubble prevents the body's immune system from reaching and attacking the transplanted cells." The aging of bone stems in part from the wear and tear of a very old cell population, according to this paper: "The adverse effects of aging of other organs (ovaries at menopause) on the skeleton are well known, but ironically little is known of skeletal aging itself. Evidence indicates that age-related changes, such as oxidative stress, are fundamental mechanisms of the decline of bone mass and strength. Unlike the short-lived osteoclasts and osteoblasts, osteocytes - former osteoblasts entombed in the mineralized matrix - live as long as 50 years, and their death is dependent on skeletal age. Osteocyte death is a major contributor to the decline of bone strength with age, and the likely mechanisms are oxidative stress, autophagy failure and nuclear pore "leakiness". Unraveling these mechanisms should improve understanding of the age-related increase in fractures and suggest novel targets for its prevention." The accumulating damage suffered by long-lived cell populations that are not replaced is an issue in many parts of the body, especially the nervous system. Our laboratory has determined that the MRL mouse strain is unique in its capacity for regenerative wound healing, as shown by the closure of ear punches with normal tissue architecture and cartilage replacement reminiscent of amphibian regeneration as opposed to scarring. One line of research into regenerative medicine is based on understanding and then recreating in mammals the regenerative powers of lower animals like the salamander or zebrafish. The existence of MRL mice, a laboratory breed originally created for quite different reasons, provides hope that the required genetic or other alterations to mammalian biochemistry are not in fact insurmountably large or complex. Some researchers believe that mammals retain much of the salamander's regenerative capabilities encoded within their genome, and that it is currently only unused or inaccessible rather than completely lost. A quest that began over a decade ago with a chance observation has reached a milestone: the identification of a gene that may regulate regeneration in mammals. The absence of this single gene, called p21, confers a healing potential in mice long thought to have been lost through evolution and reserved for creatures like flatworms, sponges, and some species of salamander. A decline in adult stem cell function occurs during aging, likely contributing to the decline in organ homeostasis and regeneration with age. An emerging field in aging research is to analyze molecular pathways limiting adult stem cell function in response to macromolecular damage accumulation during aging. Current data suggest that the p21 cell cycle inhibitor has a dual role in stem cell aging: On one hand, p21 protects adult stem cells from acute genotoxic stress by preventing inappropriate cycling of acutely damaged stem cells. On the other hand, p21 activation impairs stem cell function and survival of aging telomere dysfunctional mice indicating that p21 checkpoint function is disadvantageous in the context of chronic and persistent damage, which accumulates during aging. Still, learn by doing should be the mantra of modern biotechnology. The determination of a single gene of interest in this matter will lead researchers to investigate a narrow range of potential underlying mechanisms in order to explain why the MRL mice heal as they do. Those mechanisms can then be manipulated directly, one by one, to establish a better picture as to what exactly is going on here. This researcher's view is that the major problems in stem cell therapies for the old have yet to be solved: "Despite a wide range of therapeutic interventions, the prognosis for most patients with heart failure remains poor. The identification of stem cells with the ability to generate cardiomyocytes and vascular cells and promote local repair and survival pathways has highlighted the ability of the heart to undergo regeneration and potentially provides a new therapeutic strategy for treatment of the failing heart. In recent years, however, clinical trials aimed at exploiting the beneficial effects of stem and progenitor cells to treat patients with cardiovascular disease have resulted in mild improvements at best, suggesting that these cells and/or the conditions in which they find themselves are not conducive to cardiac repair. Heart failure is most prevalent among older individuals, and a growing body of evidence suggests that with increasing age, cardiac stem and progenitor cells undergo senescent changes that impair their regenerative capacities. Moreover, environmental alterations over time appear to impact the capacity of these cells to improve cardiac function. Understanding these senescent changes may lead to the development of new and improved approaches to exploit the potential of stem cells to repair the aging heart." Early progress towards artificial organs results in tools that are often only applicable to diagnosis and research, as is the case here - but you can see the course of the future in their form and function: "A research group in Korea have developed a method to engineer artificial liver tissue using microfluidics. The liver is one of the most important organs in the human body. ... Transplants are [presently] the only way to compensate if the liver fails, therefore research is being carried out to develop a method to create artificial 3D liver tissues which can regulate specific functions. ... Chitosan is a natural polymer with a similar structure to the components found in the liver's extracellular matrix and has been widely used for liver tissue engineering. But it's mechanical weakness limits control of the shape and size of the tissue scaffold. ... [Researchers have now] developed a microfluidic method to allow thin, pure chitosan fibres to be prepared continuously without breaking. ... Using this method, the team has been able to create a bio-artificial liver chip by culturing [liver cells] on the pure-chitosan fibres. Tests show that vital liver functions including enzyme secretion and urea synthesis were carried out by the cells on the chip." Amidst the preprint list of the Rejuvenation Research journal, I see an interesting paper I'd somehow missed: life span can be extended in old mice by transplant of a young thymus. Neonatal thymus grafts exert a rejuvenating action on various immunological and nonimmunological functions found altered in old mice. Commonly, half of a thymus is grafted under the kidney capsule. The invasiveness of the surgical procedure and the use of limited thymus tissue may explain why precedent survival kinetics remain unaffected. In this trial, we grafted two neonatal thymi into the axillary cavity of old mice, thus reducing the invasiveness of the intervention and increasing the amount of grafted neonatal tissue. Using a Piantanelli parametric model of survivorship, we found a significant change in mortality rate between the two groups (thymus graft and controls). You might recall that the degeneration of the thymus over time - a process known as involution - is one of the limits placed upon your immune system. The thymus is the source of T cells, the workers of the active immune system. Considered within the framework of a normal life span, the thymus spins up early, churns out your population of T cells while you are a child, and then largely shuts down once you reach adulthood. You are left with what is essentially a fixed population of immune cells to see you through the rest of your life. Which is a simplification of a more complex set of processes, but close enough for our purposes here. The degenerating effectiveness of an aging immune system results in large part from the limited T cell population: it runs out of T cells that are not already assigned to specific tasks. Over the years, exposure to persistent but usually harmless viruses like cytomegalovirus (CMV) chews up your quota of T cells, leaving too few to effectively defend against new threats, destroy senescent cells, or destroy cancerous cells before they can form a tumor. So you suffer, and the degenerations of aging are accelerated. One possible way to deal with this problem and restore the immune system to a more youthful capacity is to destroy the clutter. Use targeted therapies of the type under development by cancer researchers to kill off the T cells that are dedicated to fight CMV, and then repopulate your immune system via stem cell medicine. Or, more radically, completely destroy and then recreate your immune system, wiping the slate clean. This second method has already been achieved in early trials for autoimmune diseases. But another approach is to simply boost the number of immune cells circulating in the body. I've discussed rejuvenation of the thymus through tissue engineering or other techniques in the past - essentially gearing it up to generate more T cells than would normally be the case. Transplantation of young thymus tissue, as the researchers in the paper quoted above have demonstrated, is one way of validating this approach. The immune system is so critical to resisting various forms of progressive cellular and other biochemical damage in the body that it is not unreasonable to expect at least some enhanced longevity to result from its restoration. From Reuters: "researchers conducted a study in mice and found that the stem cell that produces all the different cells of the skin actually lives in hair follicles. The findings, which they say will translate for human use, mean it may be possible to harness these stem cells to help with wound repair or skin transplants for burns victims ... The same stem cells exist in humans, we can see them, and the promise is that these cells are probably going to be much better than anything we have had to date at making new skin. ... The skin has three different populations of cells - hair follicles, moisturizing sebaceous glands, and the tissue in between, known as the interfollicular epidermis. Stem cells are original cells, or drivers, from which all human cells develop. Scientists had previously thought that stem cells in each of these three skin populations were capable of producing their own cell type, but until now, a 'mother' stem cell which produces all three types had not been found. ... Scientists are already able to grow new skin in laboratories using tissue from existing skin cells from patients who have been badly burned, but the new skin is often brittle, dry and does not have hair - making it look unusual. ... the advantage offered by the 'mother' stem cell finding would be that they could grow skin from its original basis - allowing it to be 'real new skin' with moisture from sebaceous glands and the ability to grow hair." If you're a Methuselah Foundation donor, then you have access to a new area of the Foundation website: "The Donor's Key Club previews the results of new longevity research funded by Methuselah Foundation, and made possible through the generous support of our many donors. News from the laboratories, advance notice of new research results, webinars, and interviews with researchers in fields important to human longevity: all these and more will be forthcoming. Watch this space! ... Only donors to Methuselah Foundation can access the Donor's Key Club ... The first materials added to the Club include an essay by Dave Gobel and the results of research into the biochemistry of supercentarians encouraged by Methuselah Foundation. From this modest start, the Donor's Key Club will grow to be a way for supporters to learn more about healthy longevity and aging science, and clearly see how their donations are used to advance the state of the art." Via FuturePundit, I see that a recent open access paper outlines the results of applied cancer research over the past four decades. The success of the "war on cancer" initiated in 1971 continues to be debated, with trends in cancer mortality variably presented as evidence of progress or failure. We examined temporal trends in death rates from all-cancer and the 19 most common cancers in the United States from 1970-2006. ... Progress in reducing cancer death rates is evident whether measured against baseline rates in 1970 or in 1990. The downturn in cancer death rates since 1990 result mostly from reductions in tobacco use, increased screening allowing early detection of several cancers, and modest to large improvements in treatment for specific cancers. Continued and increased investment in cancer prevention and control, access to high quality health care, and research could accelerate this progress. That there is debate over the effectiveness of funding for cancer research is somewhat a function of slow and steady progress rather than sudden leaps in technology both inspiring and obvious in their magnificence - which will always be the case, people being people. On the other hand, that cancer research is so dominated by government funding has no doubt led to great inefficiency and much borderline or useless work that should not have taken place; everything touched by government funding eventually turns into a low-motivation jobs program and sinkhole for graft, no matter how urgent the cause. The dry conclusion of the paper is a conservative projection of present trends into the future, something which we should instinctively doubt given the nature of the era. Accelerating change is everywhere: any field connected in some way to computing power is rushing forward, ever faster with each passing year. Biotechnology and its application to medicine is no exception, and the next generation of cancer therapies, based on targeted nanoparticles and identification of cancer biochemistry, will be very much more effective than presently widely available medical technologies. The existence of a technology platform that can be used to efficiently and safely kill very specific cell types reduces cancer to just another information problem in biotechnology: what do the cells you want killed look like? How is their chemistry different from that of other cells? What is the specific molecular marker I am looking for here? These questions are dead center in the fast lane of life science. The therapies based upon this technology will be as far beyond chemotherapy as chemotherapy is beyond no treatment at all. The Wall Street Journal on the potency of exercise: "So what do boomers need to do not just to survive to 85, but to live healthy lives into old age? ... The most important strategy, according to the latest research to look at the question, is to be physically active in middle age. 'If you are fit in mid-life, you double your chance of surviving to 85.' ... Put another way: If you're not fit in your 50s, your projected life span 'is eight years shorter than if you are fit.' ... [These findings] are based on an analysis of 1,765 men and women who had physical examinations performed during the 1970s and 1980s at the Cooper Institute, the Dallas-based birthplace of the aerobics movement. They are a reminder that despite an array of effective drugs and other medical advances, the front line for most of us in the battle to prevent heart disease and survive into old age lies in adopting healthy living habits. ... The report also underscores the importance of physical activity in maintaining overall health: Fitness even trumped smoking cessation in the magnitude of benefit among participants in the study - though not by much. The combination of being physically fit, not smoking and having low blood pressure was a powerful predictor of longevity." From Singularity Hub: "The fastest growing age group in the industrialized world is the centenarian club. Pushing past 100 used to be a rare feat, but most demographic studies agree that by 2030 there will be about a million of us enjoying the three digit lifestyle. Those studies don't even count on the revolutionary longevity treatments we could develop in the next 20 years. We could hit that million mark much sooner, and we may start getting people past the 150 or even 200 mark. Either way, baby-boomers are going to become elder-boomers and before that happens we all need to take a crash course on what it means to live to be really really old. Turns out, it's not that bad. Judging by the centenarians scientists have studied all over the world, living beyond 100 isn't about slipping into decrepitude. A good portion of these elders live independent, happy lives without long suffering illnesses. ... Hopefully, the lessons that centenarians can teach will allow all of us to live longer and healthier lives. I fully expect the human lifespan to keep increasing, maybe indefinitely. In a few years, I may be rewriting this article as 'Get ready to live past 1000.' The longer you live, the more chance you have to access technologies to extend your life. It's a good reason to take care of yourself. See you in the next century." To follow on from a recent post on medical tourism for stem cell therapies, I though I'd note the pace of development in Asia. The medical industry in countries like India, Malaysia, Vietnam, and so forth is in many ways more energetic than in the West. It is certainly less burdened by regulation, and that makes all the difference in the long run. For so long as it costs less to achieve the same goals, the level of growth will be greater, and that difference will compound year after year. Heavy regulation and socialist command and control systems such as those that shackle medicine in the US will always ensure that a region becomes backwards and poor in the fullness of time. It will be overtaken by competing regions, and the bulk of new investment will go elsewhere. We can see aspects of this process happening now in the field of stem cell research. The real action in terms of foundational growth and application of new science is taking place outside America and Western Europe. Absent large changes in the tenor and breadth of medical regulation in the US, the future of your health will be found in Asia, because that will be where the safe, reliable, low cost therapies exist. The Manipal Institute of Regenerative Medicine (MIRM), a new initiative of Manipal University, has been created to transform stem cell science into reality by bringing together a group of outstanding scientists and providing them with an exceptional research environment. India is identified as one of the forerunners in stem cell research and MIRM is the first academic Institute in India to impart focused training in stem cell biology. International Stemcell Services Limited (ISSL) which is engaged in stem cell clinical application and banking services is planning an investment to the tune of Rs 50 crore. The funds will be utilized to establish dedicated stem cell speciality hospitals in major cities and open up Departments of Regenerative Medicine in existing hospitals. The company would chip in a portion of the funds from its internal accruals and the remaining will be raised through financial institutions. Presently, ISSL has a opened a facility at the St Theresa’s Hospital, Bangalore which is equipped with a Philips endura C-arm for transplantation of stem cells. Its Mumbai centre is a class 10,000 cGMP facility, which caters to the western parts of the country. The Pahang government [in Malaysia] will proceed with plans to set up a stem cell research hub despite questions being raised on the effectiveness of stem cell treatment, Mentri Besar Datuk Seri Adnan Yaakob said. Adnan said the state government was aware of questions being raised both here and abroad over the authenticity of claims that stem cells could be used to cure a number of ailments. He said some quarters felt that more research should be carried out to determine if the treatment actually worked but he noted that many individuals claimed that their condition had improved following such treatment. This sort of thing will continue, and the pace will pick up. A good article from Singularity Hub examines an entrepreneurial medical practice in Colorado that offers stem cell therapies in defiance of the FDA. More of this sort of proactive civil disobedience is needed, but it has a way of ending badly for those involved, sadly. FDA bureaucrats have have not hesitated in the past to destroy legitimate and responsible businesses for failing to toe the line. From the article: "RSI provides its patients with the Regenexx procedure, an adult stem cell transplant that uses your own cells (autologous) to treat joint injuries and bone damage. There’s no surgery needed. A needle extracts bone marrow, RSI isolates the stem cells and cultures them in your own blood, and then these cells are injected into the area where they are needed. They've treated 348+ patients with 800+ injections and show no signs of slowing down. According to RSI's own surveys, 89% of their knee patients showed marked improvement, as did 75% of their hip patients! Within months some patients can walk or run in ways they haven't been able to in years. We've seen these kinds of results from stem cell treatments before, but only in horses and dogs. That's because human stem cell therapies like this one aren't approved by the FDA. How can [RSI] flaunt the lack of federal approval? They claim that Regenexx is solely used as a part of their medical practice, only within the state of Colorado, and as such is no more regulated by the FDA than it would be by the FAA or the Department of Motor Vehicles." Via ScienceDaily: "Coronary arteries can become blocked with plaque, leading to a decrease in the supply of blood and oxygen to the heart. Over time this blockage can lead to debilitating chest pain or heart attack. Severe blockages in multiple major vessels may require coronary artery bypass graft surgery, a major invasive surgery. ... Successfully growing new arteries could provide a biological option for patients facing bypass surgery ... In the past, researchers used growth factors -- proteins that stimulate the growth of cells -- to grow new arteries, but this method was unsuccessful. [Researchers] studied mice and zebrafish to see if they could simulate arterial formation by switching on and off two signaling pathways -- ERK1/2 and P13K. ... We found that there is a cross-talk between the two signaling pathways. One half of the signaling pathway inhibits the other. When we inhibit this mechanism, we are able to grow arteries. Instead of using growth factors, we stopped the inhibitor mechanism by using a drug that targets a particular enzyme called P13-kinase inhibitor. Because we've located this inhibitory pathway, it opens the possibility of developing a new class of medication to grow new arteries. The next step is to test this finding in a human clinical trial." Metabolism, which might be broadly defined as the biochemical process of living, is absurdly complex. The way in which metabolism varies between individuals, and then changes over time with aging? Even more complex. This is one of the reasons why slowing aging by changing metabolic machinery - in effect creating a new human metabolism - looks very much like an inferior, harder path in comparison to attempts to restore the metabolism we have to the way it operates in youthful bodies. Approach 1: RMR correlates significantly negatively with age in women and men. Considering fat free mass, fat mass, and [weight and height], age proved to be a significant predictor of RMR in both sexes in multiple regression analysis; RMR falls by 11.2 kJ/d and 34.1 kJ/d per year in females and males, respectively. Approach 2: In males but not in females RMR decreases significantly in the course of the follow up. After ten years measured RMR is significantly lower than expected RMR predicted on the basis of body composition and fat distribution in females and males. Deviations correspond to a decline in RMR by 11.4 and 27.5 kJ/d per year independently of changes in body composition and fat distribution. Approach 3: Results of the mixed linear model show that RMR decreases in the course of aging in both women and men; after considering changes in body composition and fat distribution respective decreases were 8.7 and 30.7 kJ/d per year. These results indicate that the decline in RMR with advancing age cannot be totally due to changes in body composition. Which is interesting. It has been known for a great many years that metabolic rate declines with age in a fairly predictable way, when averaged across populations. It would not be unreasonable to attribute this change to the way in which the gross details of the body change with age, on average - less muscle, more fat, for example. But not so, apparently. Other, more subtle processes are at work. One might think of calorie restriction in this context. It is known that metabolic rate declines with calorie restriction in a variety of species, which includes primates. It is also generally the case that older humans eat less than they did when younger. One might also consider this slowing down of metabolic rate with age as one a part of the evolved cancer suppression processes that take place in the body. Less biological activity, all other things being equal, should lead to a lower risk over time of generating cancerous mutations. Interestingly, a combination of resting metabolic rate and a measure of the composition of mitochondria have been shown to correlate extremely well with the maximum life span recorded in varied species of mammal. These two items, the pace of your biology and the degree to which your mitochondria resist damage, appear to be the most important intrinsic determinants of the outer limits of natural life span. Natural life span is something we'd all like to do away with, of course; researchers have been working on that task in one way or another since the dawn of humanity. Our ancestors focused on extrinsic determinants of life span - the food, the things with claws and large teeth, the diseases. What sets our era apart is not just that we are equipping ourselves to see the true complexity and operation of our biology, but that we are equipping ourselves to change it and even repair it. The days of degenerative aging and intrinsic outer bounds to human life span are numbered. Almost nothing in biology is entirely immune to a good argument for altering what is presently thought of as cause and effect. Here, for example, a researcher argues that the metabolic syndrome we presently ascribe to excess fat, caused by eating too much, is in fact a direct consequence of that high calorie intake, not the fat. It is an intriguing view, but one that needs more evidence before being taken seriously, I think. From the release: "obesity is the body's way of storing lipids where they belong, in fat tissue, in an effort to protect our other organs from lipids' toxic effects. It's when the surplus of calories coming in gets to be too much for our fat tissue to handle that those lipids wind up in other places they shouldn't be, and the cascade of symptoms known as metabolic syndrome sets in. ... There is some disagreement in the field about whether insulin resistance is a primary cause of metabolic syndrome or just one of its features ... Insulin resistance is not the cause of metabolic syndrome, [according to this theory], it is a 'passive byproduct' of fat deposition in the liver and muscle once storage in fat cells begins to fail. ... Based on the genes they carry, some people will be better able to sustain lipid storage in fat and can get away with being overweight, even obese, without the other symptoms. Eventually, though, the need to cut calories is something all of us will face. ... Once you reach a certain age, almost everybody is leptin resistant. Nature stops protecting you once you pass the reproductive years." A great deal of work is presently taking place to develop targeted nanoparticles to kill very specific types of cell with no side-effects or collateral damage. This is good, as the applications of this technology range far beyond cancer: the aging immune system, for example, or cases of autoimmune disease could benefit from killing off malfunctioning immune cells. Many other potential uses exist. Here is another example of work in progress: "researchers synthesized nanoparticles - shaped something like a dumbbell - made of gold sandwiched between two pieces of iron oxide. They then attached antibodies, which target a molecule found only in colorectal cancer cells, to the particles. Once bound, the nanoparticles are engulfed by the cancer cells. To kill the cells, the researchers use a near-infrared laser, which is a wavelength that doesn't harm normal tissue at the levels used, but the radiation is absorbed by the gold in the nanoparticles. This causes the cancer cells to heat up and die. ... This is a so-called 'smart' therapy. To be a smart therapy, it should be targeted, and it should have some ability to be activated only when it's there and then kills just the cancer cells." The Daily Bruin looks at the work of the Gerontology Research Group and Supercentenarian Research Foundation: "UCLA's Department of Pathology and Laboratory Medicine recently autopsied 115-year-old Gertrude Baines, formerly the oldest person in the world. Baines was one of the current 77 validated living supercentenarians in the world, a group including any person aged 110 years or older. She died Sept. 11, 2009 from Senile Systemic Amyloidosis ... Supercentenarians appear to escape from the common diseases that kill ordinary people, such as heart disease, cancer, stroke and diabetes, but there's another form of the grim reaper waiting in the wings ... Senile Systemic Amyloidosis is a common cause of death among supercentenarians. The mechanism involves a slow process in which a native protein called Transthyretin, which transports thyroid hormones to the body, becomes increasingly unstable. As humans age, the carrier protein begins to unravel and misfold, sticking to the inside of blood vessels and restricting blood flow. As a result, the heart undergoes hypertrophy, growing and working harder in an attempt to compensate ... The consequence of this process includes the symptoms of congestive heart failure, but without an autopsy, the attending physician would never know the underlying cause. ... Now that we've started this research, we can draw attention to Senile Systemic Amyloidosis and we can try to find a cure for this disease. Maybe supercentenarians could live healthy even longer." I see that the Campaign for Aging Research has started a blog, populating it with fairly middle of the road posts on aging research. For example, this one on fat and diabetes risk: "It is thought that the increased chance of developing type 2 diabetes as a person ages is related to increasing insulin resistance. In an interesting study comparing insulin sensitivity between different groups of individuals, no difference was identified in insulin sensitivity between old and young athletes, between older and younger normal weight individuals, or between older and younger obese subjects. The athletes demonstrated the highest insulin sensitivity, followed by the normal weight individuals, with obese subjects having the lowest sensitivity to insulin. The authors concluded that aging alone cannot account for insulin resistance, but that the decreased physical activity and obesity that can occur with aging can be responsible for age-related insulin insensitivity. An increasing amount of research has been devoted to studying the relationship between physical activity, obesity and diabetes. It is now generally accepted that the presence of abdominal fat increases the risk for diabetes and cardiovascular disease." In a leap toward making stem cell therapy widely available, researchers at the Ansary Stem Cell Institute at Weill Cornell Medical College have discovered that endothelial cells, the most basic building blocks of the vascular system, produce growth factors that can grow copious amounts of adult stem cells and their progeny over the course of weeks. Until now, adult stem cell cultures would die within four or five days despite best efforts to grow them. Researchers at Rensselaer Polytechnic Institute have discovered a new method for predicting - with up to 99 percent accuracy - the fate of stem cells. ... In order to achieve successful stem cell-based therapies, researchers require access to large amounts of specific cells. This has proven difficult, as there are currently no methods for controlling or manipulating the division of bulk quantities of cells. When stem cells or progenitor cells divide via mitosis, the resulting daughter cells can be self-renewing or terminal. A self-renewing cell will go on to split into two daughter cells, while a terminally differentiated cell is fated to be a specific, specialized cell type. Researchers want the ability to influence this division in order to produce large volumes of the correct type of cells. Both of these lines of research feed into the search for low-cost and reliable sources of specific cell populations, and ways to quickly generate those sources from a patient's own cells. Much of the progress in this field has yet to happen, as the real free-for-all of experimentation and implementation only gets underway once costs in time and money become low enough. Everything that has happened in the fields of regenerative medicine and tissue engineering over the past decade was just a warm up in comparison to what's ahead. The recent legal exchange over the cryopreservation of Mary Robbins appears to have ended with a mixed result; the women will be suspended, albeit with the additional cellular damage caused by the delays imposed by her relatives, and the relatives will get the money that would have paid for the suspension. I agree with some of the posters in the Immortality Institute discussion thread on the topic that this appears at the surface to set a bad precedent. However, with more details in hand, going after the money might well have been impossible and certainly not good for public relations, given the way the funding was set up and the events of Robbin's last days. But put in this position as an ethical group of people, pledged to preserve the chance at longer life in the future, what are you going to do? It's easy for we onlookers throw peanuts from the gallery and call for a better end result, but it is what it is. Colorado counsel for Alcor, Eric Bentley, said, "Even though Ms. Robbins long intended that the annuity go to Alcor in connection with her cryonics arrangements, Alcor decided to release any claims on the funds in the interests of seeing her wishes completed without further delay. Alcor is hopeful this compromise helps the Robbins family find peace and closure." Mr. Bentley went on to say, "This case was never about money. Alcor simply wanted to carry out the written desires of Ms. Robbins. Alcor is pleased the matter could be resolved quickly and in the best interests of everyone involved." Fund…and overfund…your suspension with life insurance. This assumes you are insurable. Life insurance proceeds go DIRECTLY to your named beneficiary, without taxes, or reductions or delays of probate. More importantly, the funds are created in addition to your estate and do not reduce your estate otherwise going to your heirs. It is no longer perceived as a "zero sum" game where your heirs are in direct competition for funds vs. the cryonics organization. I am not aware of a single suspension that was delayed for funding considerations when there was adequate life insurance in place in a verifiable manner. Not one, in the history of cryonics, which is now extending some 40 years. Make a video of your strong preference for cryonics. Include verbiage that states your decision is unequivocal and firm, and made when you were of sound mind. Also specify your wishes that any revocation made later should be ignored if it is made while under pain medication, or while physically or emotionally ill, or under undue influence by outside parties including family and friends. Have multiple copies made, upload it to the net, provide abundant and clear instructions so that even jackass attorneys and judges can’t fail to get the message. The bottom line is that human nature is human nature. If you think that your closest relatives will respect your beliefs and the scientific evidence for cryonics when they could stand to gain $50-100,000 by consigning to you to rot in the grave, then you are probably too trusting. Armor these financial affairs, as they are too important to leave any clear opening for other people to interfere. Here, researchers identify another piece of the molecular machineries of metabolism that help to determine life span: "a protein called Sestrin [serves] as a natural inhibitor of aging and age-related pathologies in fruit flies. ... Sestrins are highly conserved small proteins that are produced in high amounts when cells experience stress. Sestrin function, however, remained puzzling until [researchers] found that these proteins function as activators of AMP-dependent protein kinase (AMPK), and inhibitors of the Target of Rapamycin (TOR). AMPK and TOR are two protein kinases that serve as key components of a signaling pathway shown to be the central regulator of aging and metabolism. ... AMPK is activated in response to caloric restriction, a condition that slows down aging, whereas TOR is activated in response to over-nutrition, a condition that accelerates aging. Activation of AMPK inhibits TOR, and drugs that activate AMPK or inhibit TOR can delay aging in several different model organisms including mammals. But how the body keeps the activity of these two protein kinases in balance to prevent premature aging was unknown. ... In future work, [researchers plan] to examine whether the mammalian Sestrins also control aging and metabolism, and whether defects in proper Sestrin expression will provide the explanation to some of the currently unexplainable degenerative diseases associated with old age." Biogerontologist Aubrey de Grey is amongst the speakers scheduled for a transhumanist community conference to be held in London in April. "How will accelerating technological change affect human mental and physical capabilities as well as the environment in which we live? Humanity+ UK2010, a one-day conference in London on 24 April 2010, gathers together some of the leading thinkers to discuss these and many other topics. ... Over the last year, the regular Saturday meetings of the UK Transhumanist Association have attracted larger and larger crowds eager to listen to and debate with speakers seeking to answer these vital questions. ... Inspired by the increasing popularity of these regular meetings, this one-day conference [gathers] together some of the leading thinkers in nanotechnology, biotechnology, cognitive science and their real-world implications. ... With 9 speaker sessions and two panel discussions confronting the big issues of tech change, this is your opportunity to engage in some of the big debates that will shape our future." I see that David Pearce will be speaking also: "In 1995, he wrote an online manifesto, The Hedonistic Imperative, advocating the use of biotechnology to abolish suffering throughout the living world." The Hedonistic Imperative - the urge to engineer paradise through technology - is an important contribution to transhumanist thinking, especially for those of us interested in engineering away the horrific, worldwide suffering caused by degenerative aging. Foresight Institute is a leading think tank and public interest organization focused on transformative future technologies. Founded in 1986, its mission is to discover and promote the upsides, and help avoid the dangers, of nanotechnology, AI, biotech, and similar life-changing developments. ... Several rapidly-developing technologies have the potential to undergo an exponential takeoff in the next few decades, causing as much of an impact on economy and society as the computer and networking did in the past few. Chief among these are molecular manufacturing and artificial general intelligence (AGI). If you have the technology base to build a nanoforge to assemble a brick, then you also have the technology base capable of simultaneously assembling and controlling a hundred million medical nanorobots of arbitrary design and programming. Or an artifical lung better than the real thing, or replacements for immune cells that never get old or worn. You get the idea. A brick is just as complex as any portion of the human body if you have to build the thing molecule by molecule; more fault-tolerant, but just as complex. The open question, while we work away at early healthy life extension technologies like SENS during the next few decades - taking advantage of the biological nanomachines all around us, learning how to better repair, use and engineer them to extend our lives - is how close molecular manufacturing is to reality and then maturity. How long does it take to go from simple nanoforge and a proof-of-principle gram of assembled brick to the understanding needed to build a blood substitute a hundred times better than the old human 1.0 version and invulnerable to disease? What are the steps along the way? What will the business cycles and industries look like? Larry Millstein: "Sequencing Single DNA Molecules"
Ralph Merkle: "The Contributions of Robert Freitas to Molecular Nanotechnology"
You certainly should take a look at Freitas' website; there is a lot of fascinating material there on the future course of nanoscale medical robotics and nanotechnology in general. Something to think about from EurekAlert! : "IGF-I is a protein hormone similar in structure to insulin and is regulated in the body by growth hormone (GH). Levels of GH and IGF-I decline progressively with age in both men and women and this drop is thought to be related to deteriorating health conditions found with advanced age. In an attempt to combat aging some people use GH as its actions elevate IGF-1. This study however showed that older men who had higher levels of IGF-I were more likely to die from a cancer-related cause in the following 18 years than men with lower levels. ... This is the first population-based study to show an association of higher IGF-I levels with increased risk of a cancer-related death in older men. Although the design of this study does not explicitly show that the higher IGF-I levels caused the cancer death, it does encourage more study as well as a reexamination of the use of IGF-I enhancing therapies as an anti-aging strategy. ... researchers used data on 633 men aged 50 and older from the Rancho Bernardo Study, a population-based study of healthy aging. ... In this study, the increased risk of cancer death for older men with high levels of IGF-I was not explained by differences in age, body size, lifestyle or cancer history." You might compare this with other findings on IGF-1 levels in long-lived humans. Why Do People Accept Aging? From the IEET Blog: "When I was in undergrad, a professor asked our whole class a strange question. ... 'Lets say that I have in my hand, right now, a pill. This pill, if you take it, will make you ageless. [If] you would take this pill, raise your hand.' ... His point was not that people want to age and die but that we naturally distrust such offers. It simply sounds too good to be true. ... Our brains are trained, over time, to understand what a reasonably possible benefit can exist for a given price. A free pill that has no side-effects and no Twilight Zone caveats (you have to be alive, can't die so are tortured, etc) seems more impossible than the idea of anti-aging itself. The problem is that this protective aspect of our mind can become over excited, so we stop believing certain solutions are ever possible. To cure, or even significantly reduce the damages caused by aging, are such an epic benefit that it seems our minds will actively manufacture problems, because the benefit must have some sort of epic cost associated. So we tell ourselves curing aging will cause too many problems and that aging has a lot of natural beauty to it and creates a lot of meaning and that all of that is good." It's worth repeating that these are entirely new donors; folk from beyond the community of early supporters who dug deep to boost the Foundation's launch and sustain its growth in the first few years of operation. This view doesn't include the more than 200 people who are members of the 300, and who make recurring donations to the Foundation that average out to around $85/month each. You'll see from the graphic above that new members of the 300 are amongst the new faces joining the Methuselah Foundation community as well. This, I think, is a promising sign. Broadly speaking, there are two ways to sway the world to your point of view: either convince the leaders and the crowd follows, or convince the crowd, and the leaders are carried along whether they want to be or not. Of course it's not that black and white in practice, and any organization speaks to both sides of the house. It's a bootstrapping process, with a little progress with the leaders here, a little progress with the crowd there, and a lot of feedback and communication taking place between all parties to muddy the waters. But the bottom line is that more new donors means that more people are hearing about longevity science and taking it seriously. Progress is underway. On a related note, we should thank the Foundation for consistently going above and beyond the norm in terms of the level of transparency they provide for fundraising progress. They don't have to do it, but they do. Transparency, as I might have mentioned in the past, is the wave of the future in advocacy and fundraising for scientific goals, and this is the best foot forward. It is good that more new theories on the mechanisms of Alzheimer's disease are emerging, such as this, via EurekAlert! One thing you don't want to see in an advancing field of science is a monoculture of ideas. "For years we thought that A-beta was just metabolic garbage produced as a byproduct of other processes within the brain, but these data suggest it is a normal component of the brain's innate immune system. It looks like factors that trigger hyperactivity of the innate immune system - not only infection but also traumatic brain injury and stroke, which are already known to increase the risk for Alzheimer's - could cause excessive deposition of A-beta. ... The researchers suggest that chronic activation of the innate immune system in response to either a persistent or transient infection of the central nervous system might lead to excess production and accumulation of A-beta. Known Alzheimer's risk factors – such as stroke, head injury and exposure to certain anesthetics – could also trigger the innate immune system and increase A-beta production, leading to an excessive and dangerous inflammatory response within the brain. ... Now we need to figure out what is triggering the innate immune system, particularly as we age, and what genes control A-beta's role in the innate response. If we can identify which pathogens are more likely to trigger A-beta plaque aggregation, we might develop ways to prevent or control that response, for example by immunization." What To Do With Leftover Copies of Ending Aging? Over at the Immortality Institute forums, researcher John Schloendorn (who worked on LysoSENS and is now one of the driving forces behind Livly) remarks: "I have a bazillion surplus Ending Aging books sitting at my house in Mountain View, CA. If anyone has a creative use for them, I can give them out for the cost of shipping or free if you pick them up." Ending Aging is a great book, and there are some good ideas in that discussion thread as to what to do with Schloendorn's surplus copies, such as handing them out at conferences, or donating them to libraries. If you have a good idea as to what to do with the copies, or would like one yourself, jump on in and have your say. Researchers have established to a more than reasonable degree that fat is important in longevity and aging. A compelling experiment in mice, for example, demonstrates that less visceral fat means a longer life. Then we have the link between fat and chronic inflammation, and the strong correlations between excess fat tissue and all of the common age-related conditions. As one of its many functions, protein kinase A (PKA) plays a key role in the regulation of metabolism and triglyceride storage. The PKA pathway has become of great interest to the study of aging, since mutations that cause a reduction in PKA signaling have been shown to extend lifespan in yeast, and to both delay the incidence and severity of age-related disease, and to promote leanness and longevity, in mice. There is increasing interest in the potential for the inhibition or redistribution of adiposity to attenuate aging, since obesity is associated with impaired function of most organ systems, and is a strong risk factor for shortened life span. Its association with coronary heart disease, hypertension, type 2 diabetes, cancer, sleep apnea and osteoarthritis is leading to its accession as a major cause of global ill health. Therefore, gene signaling pathways such as PKA that promote adiposity are potential inhibitory targets for aging intervention. Since numerous plant compounds have been found that both prevent [creation of fat tissue] and inhibit PKA signaling, a focused investigation into their effects on biological systems and the corresponding molecular mechanisms would be of high relevance to the discovery of novel and non toxic compounds that promote healthy aging. You might recall that the stated context of the Longevity Dividend initiative is to add a handful of years to life, perhaps less than ten, over the next decade or two - a very modest goal that the founders felt was sufficiently close to the status quo to use in a push for large-scale public funding. There is evidence enough to suggest that the difference between more fat or less fat, or a more healthy or less healthy lifestyle can be as much a decade of life span. So within the Longevity Dividend paradigm, aiming to manipulate fat tissue makes sense. The irreverent Viceland interviews Aubrey de Grey: "Typically, today, the therapies [of regeneration] involve things like injecting stem cells into the spinal cord or the heart in the vicinity of a trauma, to stimulate rebuilding of the damaged tissue, or else wholesale surgical replacement of an organ such as the heart or bladder with one created in the laboratory by tissue engineering. But as we progress, it will broaden to include 'molecular-level' regeneration, such as injecting enzymes (or the genes encoding them, depending on the target tissue) that can break down unwanted molecular byproducts of metabolism that are accumulating in cells as 'garbage' and that eventually impair cell function. In the case of injecting genes, we're talking about the standard techniques being developed for somatic gene therapy for inherited diseases: packaging the new DNA in a virus that worms its way into cells and integrates into the chromosome. (In many cases it will be doable much more safely, however, by performing this manipulation on stem cells outside the body, which can be verified for the correct genetic alteration before being injected.) The type of damage we repair need not be restricted to sudden, trauma-derived damage either - the gradually progressive damage that comprises aging is just as legitimate a target for regenerative medicine." From the New York Times: "What, I’d like to know, will persuade the majority of Americans who remain sedentary to get off their duffs and give their bodies the workout they deserve? My hope is that every new testimonial to the value of exercise will win a few more converts until everyone is doing it. ... Physical inactivity is one of the strongest predictors of unsuccessful aging for older adults and is perhaps the root cause of many unnecessary and premature admissions to long-term care. ... [It has long been] well established that higher quantities of physical activity have beneficial effects on numerous age-related conditions such as osteoarthritis, falls and hip fracture, cardiovascular disease, respiratory diseases, cancer, diabetes mellitus, osteoporosis, low fitness and obesity, and decreased functional capacity. ... exercise [produces] a significantly reduced risk of cognitive impairment after two years for participants with moderate or high physical activity [when older] than 55. ... Sedentary skeptics are fond of saying that of course exercise is associated with good health as one ages; the people who exercise are healthy to begin with. But studies in which some participants are randomly assigned to a physical activity program and others to a placebo (like simply being advised to exercise) call their bluff. Even less exacting observational studies, like the Nurses' Health Study, take into account the well-being of participants at enrollment." Cancers depend on continually lengthening telomeres to overcome limits on cell proliferation. If that process can be blocked, it would stop cancer in its tracks. This is the basis of the SENS approach to cancer, WILT, but there are other initiatives aimed at a similar goal: "It starts with the enzyme telomerase, which affects the caps, or telomeres, at the end of a chromosome. Telomeres shorten over time. But telomerase prevents this from happening, making the cell immortal. If cancer is triggered in the cell, the presence of telomerase leads to the growth of the cancer. Telomerase is kept in control by the protein TRF1, which keeps the telomeres operating correctly. But another protein, Fbx4, can bind to TRF1 and degrade it, causing the telomeres to lengthen. Now, researchers have discovered, a third protein, TIN2, can step in and override Fbx4 by binding to TRF1 first and preventing Fbx4 from attaching to it. This finding paves the way for developing a drug that acts like TIN2, keeping everything in check ... In 90 percent of cancers, no matter what caused the cancer to form, it needs telomerase activity to maintain the cell. Without telomerase, the cell will die. Our work is key to understanding a detailed mechanism for how these molecules interact and how to design a drug to block Fbx4." The NetAge Project website contains a lot of interesting information, even if the user interface leaves something to be desired: "Hundreds of genes and miRNAs have been identified as being involved in the determination of longevity, aging patterns and in the development of age-related diseases (ARDs). The interplay between these genes as well as the role of miRNAs in the context of protein-protein interaction (PPI) networks has as yet been poorly addressed. This work was undertaken in order to integrate the data accumulated in the field, from a network-based perspective. The results are organized in the NetAge database-an online database and network analysis tools for biogerontological research. ... The NetAge database contains gene sets and miRNA-regulated PPI networks for longevity, ARDs and aging-associated processes, and also common signatures (overlapping networks). The database is available through the NetAge website, which provides the necessary bioinformatics tools for searching and browsing the networks, as well as showing network info and statistics. By making these resources available online, we hope to provide the scientific community with a new, network-oriented platform for biogerontological research, and encourage greater participation in the systems biology of aging."